An off-the-beaten track han located in the rugged Sivas back country near iron-rich Divriği, an important trade center since ancient times. The Pamuk Han is located in a spectacular natural setting, amidst high hills and impassible sheer cliffs. It is situated at the junction where the Çalti River surges forth to join the Euphrates, in a long valley named after the river, to the north of the city of Divriği. It is near the Demirdağ Train station. Divriği, due to its rich natural iron reserves, has been an important center since ancient times. Four different caravan routes led to the city during the Byzantine era, and the Pamuk Han was built on the one which led to the north. This road follows the valley and then leads west in the direction of Sivas. The second road goes southwest through Kangal. The famous historic Koç (“Ram”) Bridge, dating from the Byzantine period, is located along this road. The Seljuk era Mirçinge and Burma Hans are located along the third road, which follows the Çalti River Valley towards the north. The last road crosses the Dumluca Mountains and leads to Arapgir to the south, and, from there, continues on to Malatya and Harput. 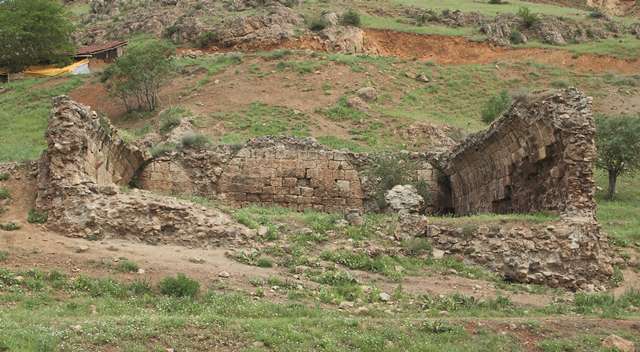 Numerous bridges are located along this road, as are hans, one of which is the Seljuk Dumluca Han.A narrow modern road passes in front of the han. The façade of the han must have been demolished during construction work carried out to widen this road at a later date. There is a bridge spanning the Çalti River near the han, and is called either the Çalti River Bridge or the Pamuk Bridge. It does have an inscription but its construction technique and architectural features indicate that it dates from the Seljuk era and may have been built at the same time as the han. It is not known exactly why the han and the bridge are called the Pamuk (“Cotton”) Han. 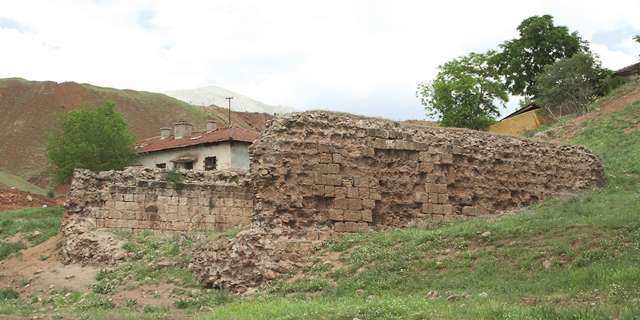 This han has not been mentioned by travelers, which could be due to the fact that this route was not favored by travelers during the Ottoman period, who preferred to take the road passing southwest of Divriği. 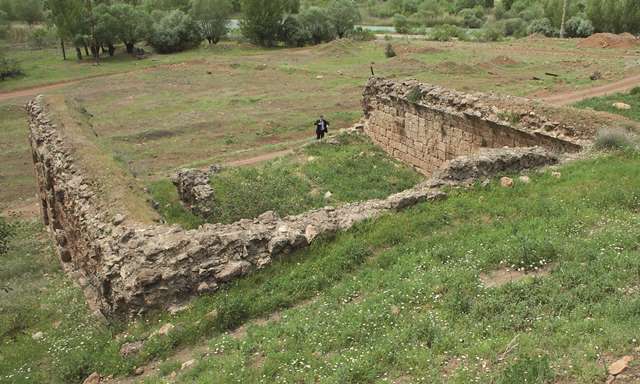 Opinions differ concerning the construction date of the han, but it was probably built after this important region came under the rule of the Anatolian Seljuks in 1252. Others have dated it to the end of the 13th century or the beginning of the 14th century according to its plan and technical features. No inscription has been found for this han. The exterior walls, except for the south side, are still standing up to the vault level on the exterior and up to the joist hanger level of the vaults on the interior. The roof has collapsed, and its rubble lies inside the building. The south side of the building is almost completely in ruins, although it can be determined from the ruins that the entrance was located on this side. It is, however, possible to reconstitute the plan from the remaining intact stones. The han consisted of a covered section only, with exterior dimensions measuring 15 x 12m. The covered section is square, and is oriented in the east-west direction. According to the existing traces, the covered section was divided into three naves by two support walls in the east-west direction. The middle nave is higher and wider than the side naves. The naves were covered by pointed barrel vaults directed towards the east wall. The middle nave was backed by two arches from the sides. There are two square piers in each of the support walls separating the naves. No traces of loading platforms have been found. No slit windows were noted in the exterior walls of the building and lighting was probably provided by skylights in the vaults. There are no traces of any decoration or a mosque. The han was built of pitch-faced stones, set in courses on both sides of the wall. The stones were filled by a mixture of pebbles and lime mortar. The roof and walls of the han are in ruins, and the interior is filled with rubble. It is believed that the stones of this han were taken and used for the the building of the nearby Demirdağ rail station. Eravşar, Osman. Yollarin Taniklari (Witnesses of the Way), 2017, pp. 119-122. Eravşar, O. “Anatolia-Syria Caravan Road and Menzil Caravanserais in the 13th century.” ARAM, University of Oxford Oriental Institute, 2007.